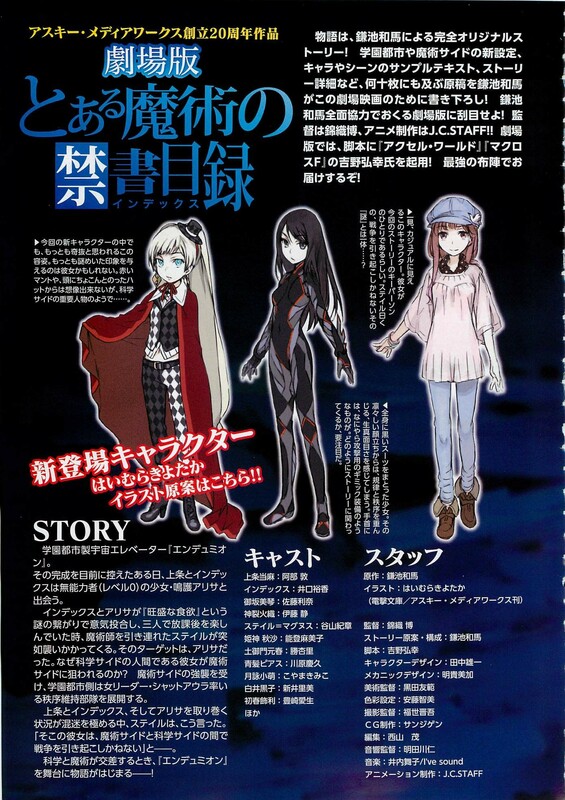 The new Toaru Majutsu no Index movie will include works by the original novel writer, original novel illustrator. New details for the universe in which the story happens have been written especially for the occasion and new characters will be introduced by the creators. The new story will revolve around the sudden appearance of a stranger near Academy City. Arisa is a level 0 girl who plays a key role in the conflict between Magic and Science. The events happen right before the space elevator ‘Endymion’ is finalized. A battle is going to happen in Academy City for the Magicians are trying to get their hands on Arisa, but attacking the Scientists is not going to be that easy. As Kamijo and Index protect Arisa, Shattoaura leads a group to counter the possible invasion. In addition to the fact that the novelist and illustrator of the novels’ return to the project, director Hiroshi Nishikiori will also be back for the upcoming movie. The script will be written by Hiroyuki Yoshino (Code Geass: Lelouch of the Rebellion, Macross Frontier), while composing the theme songs will be Maiko Iuichi (Dog Days). The exact release date for the movie is still unknown, but it is expected to be somewhere in the month of Fberuary 2013. A movie? The anime was mediocre at best. Which one? The 2 seasons, the spin-off, side story? You’ve seen them all? Season 1. Wouldn’t stand more… Still plenty to form an opinion, though. Great! The anime was quite cool actually.